NEW BEGINNINGS-IT TAKES COURAGE TO CHANGE ©: THE STONE HAS BEEN ROLLED AWAY! Love is more than a sentiment; it's putting another's needs ahead of your own. Make your activities be an outpouring of your love for God in His Son's name. 2 Corinthians 7 NIV “1Since we have these promises, dear friends, let us purify ourselves from everything that contaminates body and spirit, perfecting holiness out of reverence for God. EVERY TIME I feel YOUR Spirit Moving IN my heart my Lord, I will praise And thank YOU! I know the Lord has many more that believe as I do. Allow me to declare what I believe as I am not afraid to Teach, Preach, Speak, Praise, Love and Obey the Gospel of Jesus Christ. I confess from my heart that by faith I know Jesus died for my sins and transgressions-Long before I was even born. I believe Jesus of Nazareth to be the Messiah-The Perfect And Complete Incarnation of The Living God-Who Is my Father. I am a Christian who is a believer and follower of my Lord Jesus Christ. I believe that Jesus Is the Sole revelation of God’s Self. He is our connection of reconciliation with God our Creator and our Father. I believe that whenever And where ever His Followers go in Full desire to do Him loving service-that when opposition arises-We Shall find that the stones of difficulty, of obstruction have been rolled Away! Just as those loving faith filled women did find. 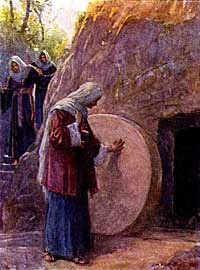 When they went to His grave and found the unmovable stone already pushed away from the mouth of His grave. He defeats death! With spices and ointments they had prepared, they came- these faith filled women to Service the Body of the Messiah with their Love. We are All called to Come with our spices of Love to do Him service and we too will find what we have been anticipating—that He is Ever Eager In Love to do us Service! Remember Him by blocking out all the other voices, noise, and threats—Remember Him. For us who have made up our minds, and have taken a stand on the side of God in the name of Jesus In Life and Work, In Love And Service We His Children must be outstanding. He has called us a Peculiar people to make known His Name. Not to go out and scream at others, to curse them and point out in the hurt and damaged ones only their faults in a hate filled voice. That is not what He said we are to do. And, we have to be with a Joy Filled heart, full of Gladness when others come with reproach to try and tear us apart and scatter us through their divisive heart. We have to be ready to stand to the side-move out of the way And let the fashions and customs and standards of this world go by; as His glory And His Kingdom are served. To be able to Spiritually discern by the power of the Holy Spirit that lives in our hearts is very important to the Calling And the Direction that God has placed on each of us. So many people want a man-made messiah-they just cannot wrap their heart and faith around the Spiritual, God Sent Messiah- Jesus. No one can keep God small and ‘in a box’ and ever see and know the Fullness of His Presence. Where you find those that prefer truth over lies and image, celebrate there! The Strength and beauty we need are in His sanctuary. Excellence and beauty thrive in His sanctuary-GET THERE! Learn to discern the places where the Lord has gathered unto Himself those of two or more who continually prophesy (those that speak forth) in the name of Jesus, according to the Grace that God has given them. And know that there will be those that will challenge you when you follow the Spirit Lead Ways-instead of the man led ways. God has called and separated those that belong to Him unto Himself. Even so as Jesus gathers His sheep up And out of the church era leading us into His Kingdom era Season, do we follow Him trusting by faith with every step! As you step, with those who as yourself have paid a price before the Lord, you will cross paths with those that accuse because they ‘think they know fully’ when they actually do not. They are so caught up in their flesh and fears, afraid to allow God to Be God, that their pride has tricked them and the fruit of their pride is to tear at, discourage, ridicule and try to take away from us, our God-given assignments. They self-appoint themselves to be the watchers of self-righteousness. They actually live by the worlds standards-never going deeper to seek Jesus on their own. I encourage you to watch the response of those of us that the Lord has moved into their places as He always orders the steps of those that seek His Righteousness. Their humility counters pride and our fear of the Lord fights for us-clothing us with His Strength, His Beauty And Rest in His Sanctuary-The Lord is our shelter, Always. We are to Bear Reproach Gladly. We are to know that the Rest our souls need, is found at His Feet. This place of rest is the place of humility-Of total surrender. I know this is hard for a lot of people. But if you take it all one day at a time-and give yourself some breathing room you Can do what He has called you to do. Remember the mustard seed? Those that come against us- think they know but actually have been tricked by satan’s lies, they only know through flesh, their pride and Spiritual immaturity. Here we are to remember that the Lord God is Our Father—that we are those that are connected to Jesus through His Spirit that lives in us. As we offer our obedience to His Will and purpose for our lives--We are to rejoice that as we serve Him humbly. When we have matured past being offended by the flesh and ignorance of others -then we are able to be content when people think ill of us. 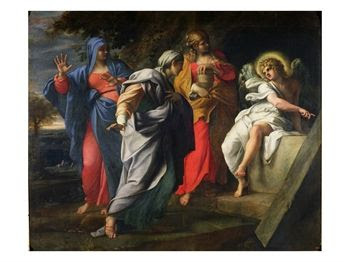 When we can bear reproach and scorn gladly, (i know you may want to cuss and fuss someone out-but that is not you anymore)- Always professing our Love for Jesus by shouting loudly, or speaking softly to our hearts—Thank You Jesus; then I ask you, what in this world can disturb the gladness of our soul, And its rest? Nothing! The Stone has been rolled away already! The Word of God is Truth and a two-edged sword. Let us call on His Word to remind us of Whose we are and belong to. I know how to see through truly deceptive ways, actions, and words of people that live to do the enemies biding. We are to read and meditate on God’s Word -Psalm 199:11. This produces and strengthens our confidence in God- in His Son and His Holy Spirit. Sickness, lack, shortcomings, lies, smoke and mirrors, threats, and all other challenges that come against us—I stand against it and use my belief that God is Still God and just as Jesus spoke to us, He is our Help! I call on Jesus because I know He is Ready, Willing And More than Able to do more than what I could ever think of or do. He Is responsible for taking care of me and my family And I am supremely and completely triumphant in He that has conquered death, fear and this world. Matt.17:17-18. I know in this matter of ‘believing’ that All unbelief is an enemy that cannot change its colors through religious rhetoric or fleshy tricks. When unbelief is present, it will negatively affect the outcome of any situation and all circumstances. The enemy of unbelief is always on a mission to close all doors that the Word of God came to open for us. Are you going to allow the enemy to close the doors that Jesus was sent to open for you? Unbelief is not an opinion-but is a tool used to make you reject the covenant plan that God spoke over your life. He sent His word to heal those that believe! Jesus is the Word that brings life! Amen. To believe is to Release the power of God in the name of Jesus. Know that unbelief fundamentally Always opposes the Message of our Lord Jesus. I declare Matthew 5:16, And my light given to me through Jesus has been ‘set on a hill’, not under a bed And my light Will remain right there-where God put me to shine in Jesus’ name. I am connected to the Head, not the tail I am Above, not below! According to Psalm 96:6 my light Will shine from there And Will reflect the Lord to all that come my way. I use my gift of discernment to see and Know when controversy and attacks of prideful people are sent against me. I Will stand clear of what I don’t understand or cannot be controlled by me. I Refuse to align myself with accusations and the spirit sent to spread frustration, lies , hurt and confusion pertaining to His Will for my life. His Spirit of Joy strengthens me—I Am grateful, overwhelmed with His goodness; And I know He Will always deliver me from every agent of hurt and pain. My Heart And Spirit, my Soul know that Wisdom is the salve for any condition I find my heart in. Nothing Is Impossible for me as I lean upon, rely upon, adhere to, and trust by faith in Jesus. Thank You Father God, in Jesus’ Name, Amen! Greetings to you sister Ephiphany! it is so good to hear your Praise of our Lord Jesus! I pray that All Is Well with you and yours! i'll be over to visit your place today. I pray that You come to know the Fullness of His Love And Power in this Holy Week And year to come.